We are proud to announce that Secretary Richards has received a SmartCEO Brava Award for high-impact female business leaders on July 18th in Philadelphia. This award demonstrates PennDOT's innovative approach to connecting people through transportation and the Secretary’s entrepreneurial drive and deep commitment to giving back to the community. She is honored to be in the company of the other exemplary female leaders. Since her appointment as Secretary of Transportation, Leslie Richards has maintained a focus on innovation and has driven several key projects aimed at improving customer service, keeping the community safer, and putting PennDOT at the cutting edge of new technology. Given her unique background as an urban planner, she is focused on identifying innovative ideas to modernize and preserve our transportation. Notably, as the first female Secretary of Transportation in the Commonwealth of Pennsylvania, she is also committed to encouraging and supporting diversity on our team. In addition, she fosters planning and collaboration with communities, leaders, and companies to invest time and resources wisely. Secretary Richards firmly believes you must "see it to be it." She works with high school and college students and recent graduates, encouraging them to reach out to her and allowing them to shadow her at work. In addition, the Secretary serves as a mentor, and speaks at local groups, such as the Forum for Executive Women, to share knowledge and answer questions with other like-minded women from diverse backgrounds. The Brava Awards program celebrates high-impact female business leaders. Brava award winners combine their irrepressible entrepreneurial spirit with a passion for giving back to the community, and are exemplary leaders of both their companies and their communities. They encourage local philanthropy, mentor up-and-coming leaders and set their companies on the path to tremendous growth. We could not think of a more deserving person for this award than our own Secretary Richards. Also, this week, PennDOT Secretary Leslie S. Richards was named chair of the Pennsylvania Turnpike Commission (PTC) as part of a reorganization commissioners approved during a bimonthly meeting of the five-member panel. Pittsburgh businessman William K. Lieberman was appointed vice chairman of the PTC, and former Senator John N. Wozniak of Johnstown attended his first meeting as a Turnpike commissioner. In addition, PTC Commissioner Barry Drew of Mechanicsburg was named secretary-treasurer. 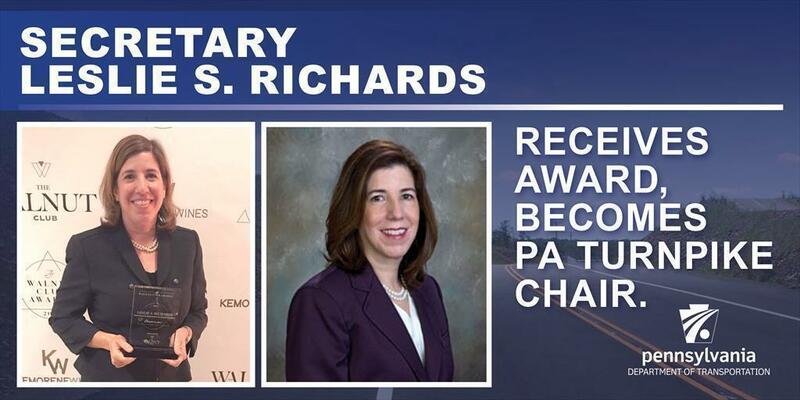 "I have had the honor of serving as the commonwealth's first female transportation secretary since I was named to that post by Governor Tom Wolf in January 2015, and becoming the first female PA Turnpike chair is an equally remarkable privilege," Richards said. "The first Turnpike commissioners were appointed in the spring of 1937, and accomplishing a milestone like this in an organization that was started more than 80 years ago, is undoubtedly historic. I'd like to thank my fellow commissioners for the faith they have shown in me." Secretary Richards as turnpike chair is committed to overseeing the turnpike in a way that ensures its efficient operation. She looks forward to working with commissioners from both parties to achieve that goal. For more information on Pennsylvania The Department of Transportation, visit www.penndot.gov. Follow PennDOT on Facebook, Twitter, and Instagram. Also, be sure to follow Secretary Leslie S. Richards on her Facebook and Twitter.